Garner is actually not that bad in the film, she is game, but the script lets her down and the scenario seemed easier to settle than what was on screen. The director of the film is Pierre Morel, who did the first “Taken” with Liam Neeson in 2008. He hasn’t learned anything new on this revenge spin, and the story also contains many stereotypes having to do with a vague drug cartel. In a sense, it’s a revenge fantasy in Trump’s world, as the white woman is saving the world by blowing up the Mexican cartel, with a leader that looked like Freddie Mercury. Only ardent Garner fans would be interested in this, and it’s surprising that the production thought that this may become a franchise. Only the box office will know for sure. Riley North (Jennifer Garner) is a working class wife and mother – which the story established by having her and her daughter as rivals to a parallel snooty upper class mother/daughter combo. She is trying to keep her family together, even as her daughter is snubbed by the upper crust set, and her husband Chris (Jeff Hephner) is trying to uplift their fortunes by getting involved with a drug cartel (typical). Chris foregoes his role in the cartel at the last minute, but this doesn’t satisfy the drug lord Diego “Freddie Mercury” Garcia (Juan Pablo Raba), and he summarily sends his gang to kill Chris and the daughter in front of Riley, injuring her. 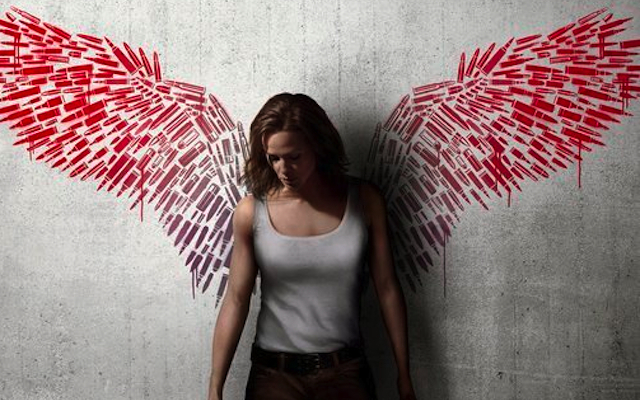 After a crooked judge lets the killers go, Riley goes underground to train for her revenge. When she emerges five years later to apply revenge to all who wronged her, LAPD’s Det. Carmichael (John Gallagher Jr.) and FBI agent Inman (Annie Ilonzeh) are perplexed. 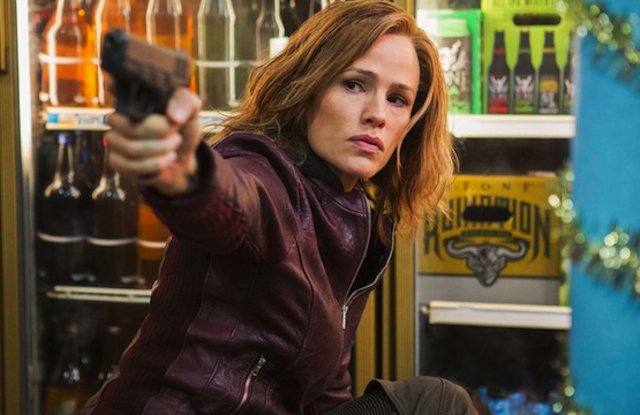 Garner knows the action genre, having performed it in TV’s “Alias,” but it is obvious that she has grown out of it, and is miscast in this current incarnation of the style. However, she’s a pretty good actress, and manages to keep the character afloat despite the idiot plot. The reasons for her revenge are apparent, it’s the motivations for that revenge that are lacking. If the same character had been created in a better story, it might have worked, but there is no holding-of-breath waiting for that example. And despite its “R” rating, the plot structure is so cookie cutter they could have sold it in a kitchen store. As long as the bad guys are menacing (in this case in expired Hispanic stereotypes), then any white knight can emerge to carry out the justice that, in this case, L.A. police and the FBI are useless against (oh, for J. Edgar Hoover to punish them with his parasol). There is a requisite scene that shows law enforcement sitting in front of a fancy tech “big board” of L.A. crime, where a nerd analyzes the data in real time… all this and they can’t stop a crooked judge? There are many unintentional laugh-out-loud moments, mostly having to do with drug lord Freddie Mercury. He spits out his lines as if he’s chewing nails, and alway punctuates his rants with copious pours of brown liquor into a crystal glass. And whenever an ice pick is spied being use to yes… pick ice… we know damn well that Freddie will wield it as a weapon at some point. Why the title, you may ask? I kid you not, it was the flavor of ice cream Riley’s daughter ordered before her drive-by demise (keep younger and more sensitive viewers at home). Imagine the film if the daughter had ordered Cherry Garcia. Then imagine what a long strange trip the movie could have been.